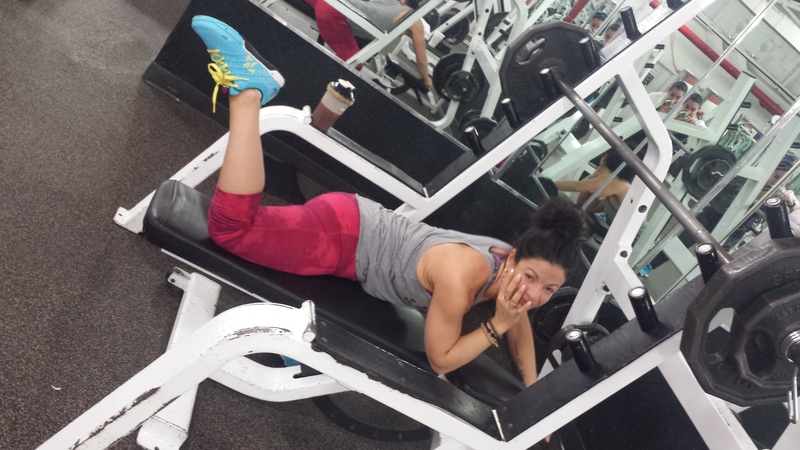 Ahaha, you know…just loungin’ around the gym! If you don’t know, I’ve committed to compete in a fitness competition. I’m totally IN and #Trust it’s a process and definitely pushing me to step outside my comfort zone. There are moments I want to cheat, give in and then I force myself to remember why I started. I want to live as an example for me and YOU! Yeah, I’m fit. Yes, I know I’ve “come a long way” and I’m “getting older”, but I choose to go against what “most people” think, because I’m just not most people. I choose to believe that I’m only getting better and I’ve set my bar pretty friggin’ high for this year! This competition is beyond any challenge I’ve ever taken on. I’ve climbed mountains, run marathons, mud runs…all of that, but THIS is TRUE discipline. Everything you eat and drink shows on your body, not just your workouts. My show is July 11th here in NYC and every day I’m working to be my absolute best. My goal, friends, is to not just show up on game day, but to show up to WIN. Think about something YOU want; a body, a job, a relationship. You’ve got to believe you’re worth having it and then take steps to get there every single day. There will be many…many reasons daily to give up, to give in, but there are WAY more to keep on keepin’ on! You’ve got to remind yourself in the tough moments that you are worth the temporary discomfort. It’s in the moments that you want to give in, that are hard, that force you to dig deeper than you have before that you’ll find what you’re made of and you’ll raise your standards for yourself. It’s time to get after it, Friends! Set your mind on what you want and GO GET IT! Come #GETFIERCE with me this week!